A brand new event and race has been added to the Koh Samui running calendar; Skal Samui 10 Mile run, Sunday 21st October, 2018 and a 2 mile obstacle course. 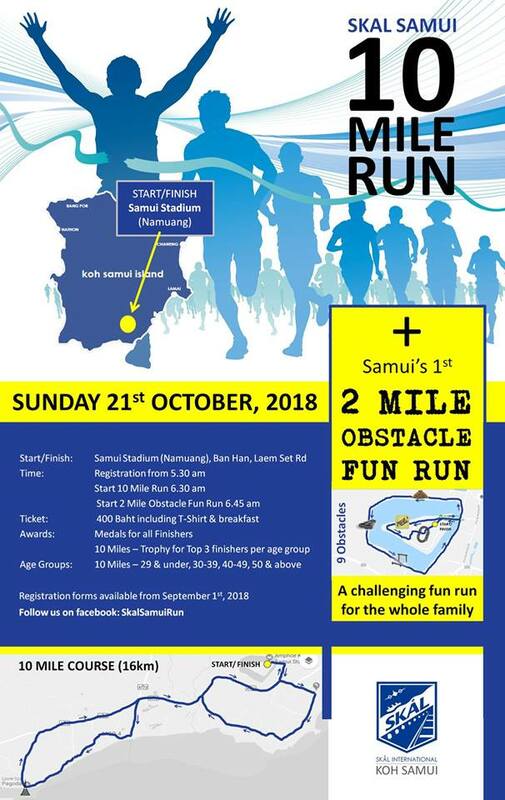 The start and finish of this not so common distanced race will be at the Namuang Stadium, a relatively late start at 6.30am and a 6.45am start for the 2 mile obstacle course. More details will be released soon. Entry fee is 400.-THB for a T-shirt, breakfast and a BIB number. A medal will be available to all finishers and the top 3 finishers in all age categories for the 10 mile race will receive trophies. Age categories will be 29 and under, 30-39, 40-49 and 50 up. Registration forms will be available as of 1st September, 2018. 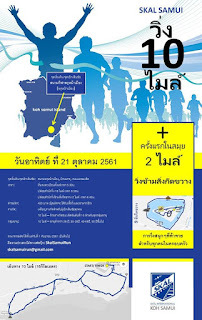 The 10 miles is not a very common race distance in Thailand, I only participated in two 10 mile race so far. It's an exciting distance and in that part of the island, most certainly also a challenging route, with a few hills in it. Looking forward seeing there in due time! There are still a few other races to be run on Koh Samui and the mainland in the meantime.